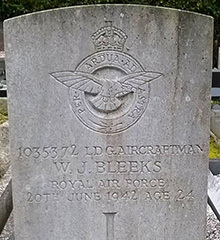 Leading Aircraftsman William Bleeks was born on 28th May 1918 and prior to service with the R.A.F. he worked in the Seagoe Hotel, Portadown. 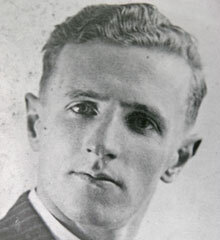 He was the eldest son of Robert and Elizabeth Anna Bleeks (nee Wright), Hawthorn Cottage, Stewartstown, Co. Tyrone and husband of Mary Jane Bleeks (nee McCann) of Portadown, Co. Armagh. He was killed on active service as a result of an accident at Skeabrae, Scotland.